A name occurring in Judith i. 6b, and designating apparently the Chaldeans. In place of the rendering of the A. V., "many nations of the sons of Chelod assembled themselves to battle in the plain of Arioch in the days of Nebuchadnezzar and Arphaxad," it is perhaps better to translate—following the Greek version—"there came together many nations unto the array of the sons of Cheleul." The Syriac renders "to fight against the Chaldeans." 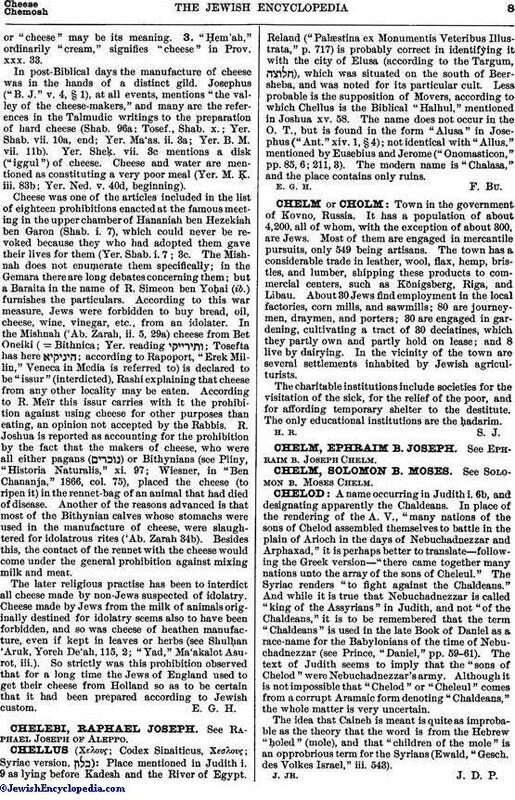 And while it is true that Nebuchadnezzar is called "king of the Assyrians" in Judith, and not "of the Chaldeans," it is to be remembered that the term "Chaldeans" is used in the late Book of Daniel as a race-name for the Babylonians of the time of Nebuchadnezzar (see Prince, "Daniel," pp. 59-61). The text of Judith seems to imply that the "sons of Chelod" were Nebuchadnezzar's army. Although it is not impossible that "Chelod" or "Cheleul" comes from a corrupt Aramaic form denoting "Chaldeans," the whole matter is very uncertain. The idea that Calneh is meant is quite as improbable as the theory that the word is from the Hebrew "ḥoled" (mole), and that "children of the mole" is an opprobrious term for the Syrians (Ewald, "Geseh. des Volkes Israel," iii. 543).